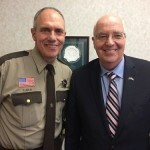 Next week, KDWA will air an IN Depth program featuring Dakota County Sheriff Tim Leslie and Dakota County Attorney Jim Backstrom. The topic of the program is the continuing dialogue taking place in Minnesota regarding the possible legislative support to legalize the non-medical use of marijuana. Sheriff Leslie explains that difference. While they support physician prescribed medical use, they both oppose the lessening of penalties for recreational use of THC in the state. Tune in for our upcoming In Depth that discusses this legislative hot topic.